I have been meaning to get this post up for several days but it seems like things just kept coming up. I feel bad that it is so late but better late than never I guess. 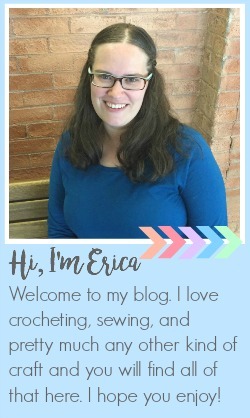 I am really excited to work with Sugardoodle, and some amazing bloggers who are sharing their awesome Easter projects and ideas. The idea that I want to share today is an Easter advent activity created by Sugar Bee Crafts. With 5 little kids I am always looking for fun, creative, kid friendly ways to incorporate the true meaning of holidays like Easter. The Easter Bunny, Easter Baskets, egg hunts and all of that is a lot of fun but I want my kids to know that that is not the real reason why we celebrate Easter. That it is a time to remember Christ and the sacrifice he made for all of us. Sometimes it is so easy to get caught up in the other things that we forget the real reason behind it. Mandy from Sugar Bee Crafts came up with this great advent with different activities for each day, things like taking treats to someone, watching videos or reading stories of Christ, and making resurrection rolls. We made those for Easter last year and my kids thought they were really cool so I am sure they will enjoy doing it again. 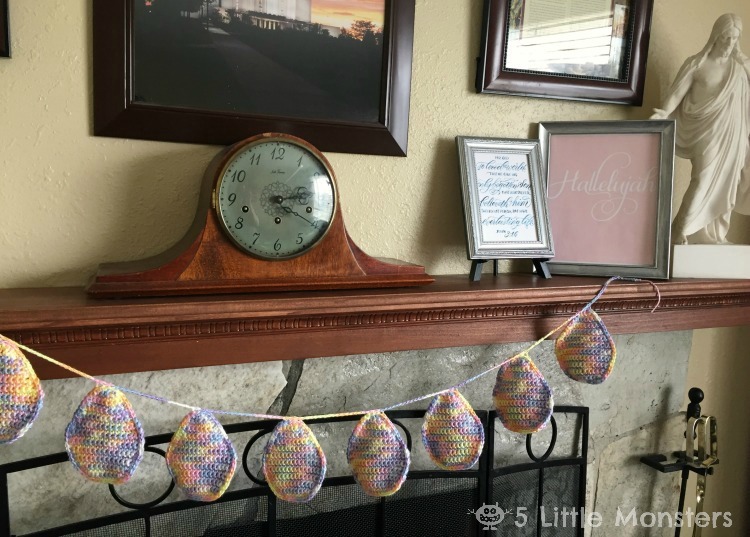 She made paper strips telling the activity for each day and used numbered plastic eggs to hold them. She made a cute little tree to hang them on too. You can see her version here. I decided to do mine a little different. I got the idea from the stocking advent that I made for Christmas, I thought why not crochet something that can double as an advent and a decoration that we can reuse each year. I shared the pattern just the other day for a crocheted egg that can be made with a pocket on the back. I made 8 of those and then crocheted them together on a long chain. In the pocket on the back of each egg is the folded up paper telling what to do that day. Then I hung it on my mantle. Each day we pick a paper from an egg and do the activity listed for that day. The papers are listed 1-8 and you work backwards with 8 being the first day and 1 being Easter. I am really excited to do this advent with my kids, we actually missed yesterday which was the first day because we were busy visiting family, but we started today and I think that they are really enjoying it. I know it is a little late but if you would like to check out the advent activities and see if there are some things that you can do to help your kids understand the real meaning of Easter you can download the printables below. 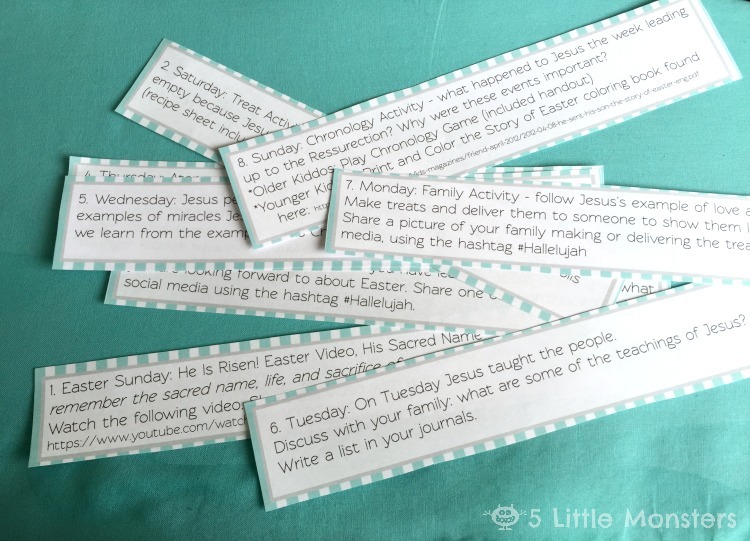 There is an overview of the activities, the 8 activity strips (2 pages), and a couple of different activities including a printable recipe for the Resurrection Rolls. If you use any of the ideas or printables from this post be sure to share it on social media with #Hallelujah. So beautiful! 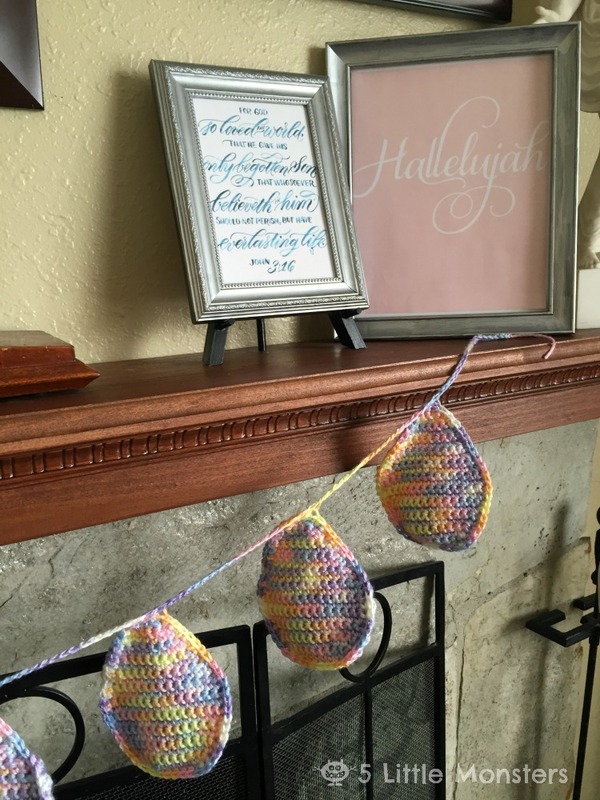 I love the crocheted egg banner. I wish I had your talents! Thanks for sharing.